All transactions are safe and secure with a reliable history in online purchasing behind each of our associates. Buy the Battlestar Galactica Sweatshirt to own Battlestar Galactica clothing and merchandise. Stay warm during those chilly nights on Caprica with this Battlestar Galactica sweatshirt. 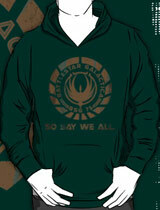 The hoodie features the BSG TV show quote, "So say we all" on the front underneath the flower emblem. It is similar to the design on the back of the Battlestar Galactica t-shirt shown here in the gallery. "BSG" is an acronym for "battlestar group," and it is also an acronym for the television series. This sweatshirt is the perfect addition to any fan's collection of Battlestar Galactica merchandise. In addition to the Battlestar Galactica Sweatshirt above, browse the Battlestar Galactica Clothing Gallery for more apparel like men's and women's clothes, kids shirts or hoodies.